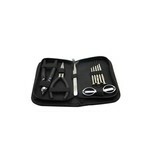 The Essential Tool Kit is a compact and afford set of essential tools in a durable zippered carrying case, including three different drivers, needle nosed pliers and tweezers, flush cutters, and foldable scissors. The three drivers included are comprised of a pair of Phillips heads and a flat head driver, with each driver featuring a knurled grip. A foldable pair of scissors and a pair of flush cutters tackle wicking and wire materials, respectively, effectively while needle nosed pliers and bent needle nosed tweezers allow for general precision adjustment. 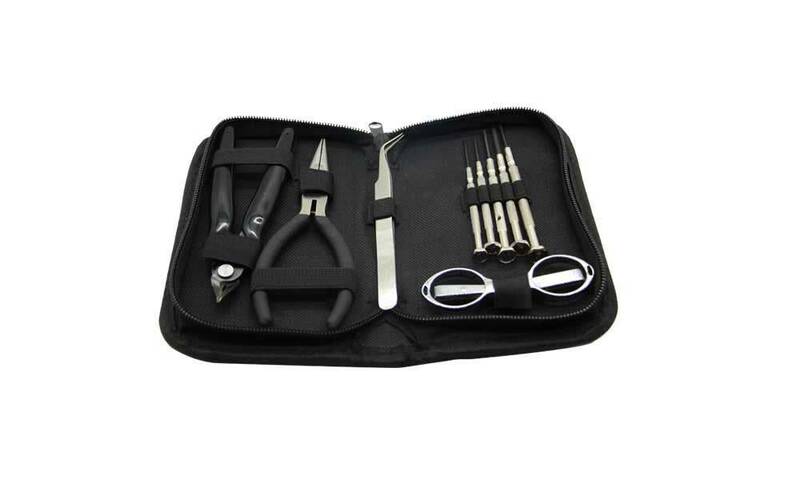 With a line-up of essential tools combined with a convenient carrying case and a highly affordable price, The Essential Tool Kit makes for a perfect gift or addition for any vaper.